The plantar fascia is a thick band of tissue that covers the bones along the bottom of the foot and connects the forefoot and the heel. And when there is too much inflammation in this vital tissue, it can develop to the condition that’s known as Plantar Fasciitis. Plantar Fasciitis is one of the most common culprits of heel pain in runners and amounts to roughly 10 percent of all running injuries. Symptoms: Plantar fasciitis manifests as intense pain and extreme tenderness along the bottom of the foot near the heel, particularly within the first few steps after getting out of bed in the morning, getting up after prolonged periods of sitting, or, apparently, while running. Causes: Some of the of leading causes of the injury include overtraining, and running in the wrong footwear. Extreme pronation and supination can also be culprits to the ailments. In addition, runners with a very high or very low arch are also at greater risk of the injury. Other causes include too much standing on hard surfaces, ramping up running mileage too quickly, and tight and/or weak lower body muscles. Fix It: For a quick fix, grab a frozen water bottle, then roll it under the sole of your foot backward and forward for five minutes at a time, a couple of times per day. To speed up recovery, make sure to step back from running, and stretch the fascia tissue at least a couple of times per day. If the pain persists, then you should see a physician. 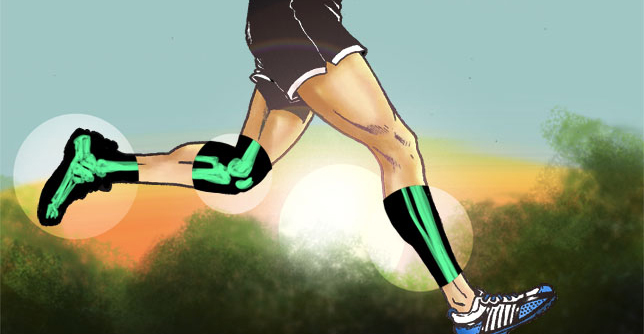 They might suggest putting on custom-made orthotic, or a night splint to speed up recovery. These are all viable options to consider if all else fails. Prevent it: First off, stretch your plantar fascia and calves on a consistent basis—especially if you are about to run in the morning as the fascia tends to tighten overnight. Plus, make sure also to work on developing core strength—especially if you have a bad history of the injury. Furthermore, strengthen your calves with heel raises, toes raises, and eccentric heel drops. Plus, avoid strapping on high heel or flip-flops, both of which can irritate this band of tissue and shorten the calf muscles. This entry was posted in Articles, Foot, Injury, Performance, Prevention, Running, Sports, Training, Treatment by sportsmedicineweekly. Bookmark the permalink.